By using reclaimed materials in a new build, the builder will be assured he has built a home that is unique. Think how eco friendly you will be if the materials that made your home are from reclaimed stock? If sourced locally, you'll not have the same carbon emissions as purchasing new; from lorries making long deliveries and from factories and machinery producing the material. As well as using reclaimed bricks, roofing tiles and timber it is also possible to furnish the home and garden using reclaimed fittings and furnishings. The cost of reclaimed basic materials should be a lot less than the price of new material. It is essential that you check there is enough material for the job as it could be very hard to locate a further supply if you under estimated the quantity required. It may be that you will aim for a higher quality material when sourcing reclaimed building material. Pound for pound you will have more value for money when purchasing reclaimed materials. Factor in any delivery charges when calculating costs. Rather than assume you will save money by using reclaimed materials do your homework and cost out the build carefully. Do your homework, visit companies that sell reclaimed building materials and get a feel for the cost and what is readily available. By using materials such as roof tiles and handmade bricks you will be bringing a style and design to your new home that is unique; it'll also be possible for your home to look aged and mellow rather than stand out as a bright shining new build. If your home is to be built within an established area it will blend in with ease if the materials do not have that ‘just made’ look. When reclaiming building materials you must check thoroughly to ensure quality. Wood should be checked for woodworm and fungi and treated when necessary. Bricks should be clean and not chipped and if using roof slates they should not have flaked or worn thin. Weathering can make materials look good but they can also cause damage, so use your discretion when checking the quality and do not rely on others to do this work for you. When self building we are expected to supply samples of bricks and roofing materials to the planning department for approval. Explain that you wish to use reclaimed materials so that you can work with the planning department from day one and not have problems at a later date. Keep your eyes peeled for buildings that are being demolished in the area you hope to build. There may be an excess of materials on site that the builder is wishing to sell thus saving you both money. Offer to clean bricks and tiles yourself and use your own transport. Call in friends to help with the work. If you need specific materials there are now reclamation yards that specialise in older materials and fittings. 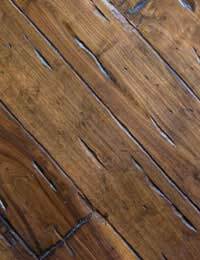 In fact you can even visit exhibitions of reclaimed building materials such is the revival and interest in using reclaimed stock. The Internet is your friend when sourcing the ideal material for your home.